Here is an Unusual LED indicator for the Battery. It turns on fully when the battery voltage is above 13 volts and starts to blink faintly when the voltage drops below 12 volts .Finally the LED turns off when the voltage drops below 10 volts. 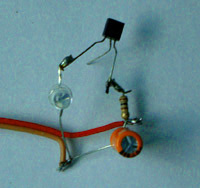 Its design is unusual because the LED driver transistor is connected in an unusual way.